Danielle has been a champion throughout the process, working tirelessly not only to operationalize the changes, but also to keep everyone who needs to be in the know in the know. For orientation, we have an incredible reach within the university community and Danielle has taken it upon herself to think about the improvements needed in our program and communicate them in a timely manner, while also engaging stakeholders in the conversation about these changes so we can inspire a shared vision throughout the process. Danielle is exceptionally creative as she thinks about ways to make things work… she engages our students into the conversation as well, considering the orientation leaders as a direct resource to contemplate how these changes will influence students. Danielle is always thinking, always on the edge of her seat with a bright idea, and never appears frustrated about the hard process that change brings with it. 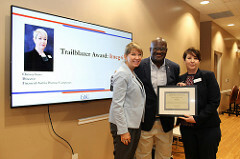 Ella is a true professional who exemplifies the Career Center’s core values. She is highly focused on doing all she can to help students fulfill their goals and works tirelessly and cross-functionally in support of that mission. Ella is a team player, excellent communicator, and a leader among leaders. 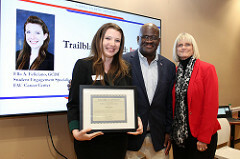 She is innovative, but highly goal focused and directed, and will do most anything to help support the mission and direction of the Career Center and the Division of Student Affairs and Enrollment Management. In a year of growth and complex changes, Ella continually added value, problem solved, and was always ready to contribute. 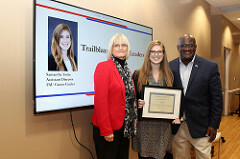 Her efforts have led to the development of programs division-wide as well as in the Career Center. 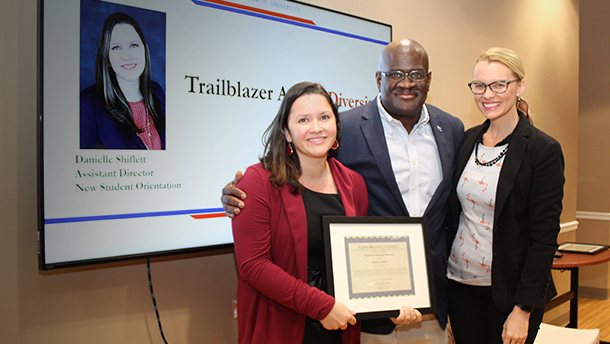 Performing two important roles within the Career Center as a practitioner and leader of the liaison team, Samantha truly lives the Divisional value of leadership. She does an excellent job in building consensus; setting vision and building buy in from internal and external stakeholders. Samantha has had to take on additional responsibility and quickly establish herself as someone who can deliver results and help the team achieve their goals. Samantha is very conscientious and follows through on responsibilities in a timely manner. Samantha not only works hard, but she is a key component of the success of many of our career initiatives. Shakita serves as one of the Assistant Directors in Owls Care Health Promotion. This semester, she has worked tirelessly to promote substance safety across the FAU campuses. This includes implementing Sober Tailgates at every home football game, facilitating dozens of workshops with both Greek life and Athletics on safe alcohol use, training sober monitors, and being responsible for the satellite offices of Owls Care. 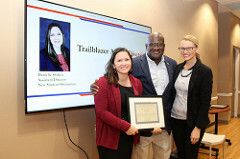 She has meticulously constructed the Biennial Review, in compliance with the Drug Free Schools Act, which will help pave the way for the future of substance safety at FAU. 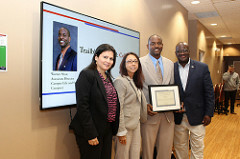 Warren uses innovative ideas to build collaborative bridges between Broward Campus Life and select faculty and community partners as a means to engage the Campus and community with the Student Union facility. 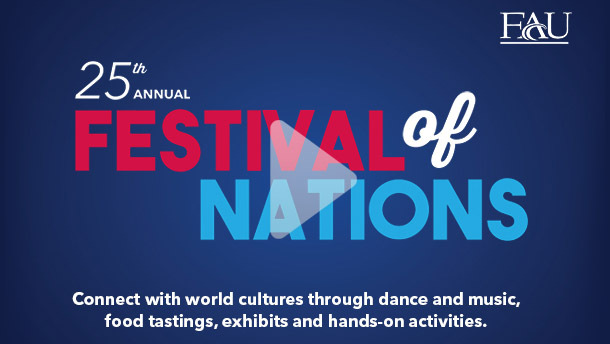 An example of his collaborative spirit is the Weeks of Welcome new event, Taste of the Town, which brought in over 15 local food vendors to the Davie Student Union for promoting their business to the FAU Broward campuses community. This concept is extending to local retail services in the spring 2019 rollout of Marketplace. 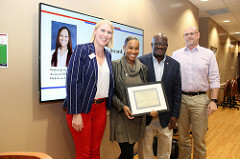 Another example is "Who's Who at FAU,” which required collaboration with Fraternity & Sorority Life, New Era Barbershop, Testing & Evaluation, and The Writing Center. Chrissy effectively organizes, arranges resources, and establishes clear goals to meet organizational objectives. She recognizes the importance of strategic planning and takes a visionary approach to problems and opportunities. Chrissy has led the Jupiter One‐Stop team through multiple changes over the past year. Her ability to lead directly and indirectly set her apart from her peers. She faces adversity with a positive attitude, clear head, and get-it-done spirit. She serves as an outreach liaison and contact for the State of Florida, Office of Student Financial Assistance. Chrissy strives for self-improvement and awareness and has attended 20 webinars, conferences, and workshops in the 2018/2019 year to date. Her performance establishes a model for others to follow. She exemplifies our core value of care for self, care for others, care for community.